Home » Home page articles » Capture and purification of recombinant albumin-fusion proteins using AlbuPure®. Human serum albumin (HSA) has a vast array of applications within the BioPharmaceutical industry including; plasma expansion, formulation excipient, drug delivery, wound healing as well as extending the half-life of a protein drug as a fusion partner. A wide range of albumin-fusion proteins (Albufuse®) have been produced to extend the circulatory half-life of the fusion partner whilst maintaining it’s activity. Veltis® developed by albumin-fusion leaders Albumedix is a single step expression platform for the production of proteins with extended half-life eliminating lengthy and minimising costly post-production processing, providing clear patient benefits and reduced healthcare costs. In order to support the rise in the production of recombinant albumin-fusion proteins, an affinity matrix is required that is highly stable, robust, non-toxic and provides high binding capacity, recovery and purity. AlbuPure®, developed in collaboration with Albumedix and manufactured exclusively by Prometic Bioseparations Ltd (PBL), is produced in a controlled environment to ISO 9001 quality standard and is designed for use in cGMP manufacturing of biological molecules. The AlbuPure® adsorbent comprises a novel synthetic triazine ligand derived from PBL’s Mimetic Ligand™ technology and coupled to PBL’s proprietary PuraBead® 6HF base matrix. This proven technology provides a stable ligand and attachment chemistry with low ligand leakage, enables the use of 1 M NaOH for sanitisation and provides excellent adsorbent lifetime. In this application note, the capture and purification of recombinant albumin-fusion proteins using AlbuPure® is described. Purification of different albumin-fusion proteins (1) IL-1ra and (2) anti-HIV gp41 were performed using AlbuPure® on an automated chromatography workstation. Both columns were packed, equilibrated and operated as summarised in Table 1. The Alumedix yeast based high expression system was used to produce cell culture supernatant (CCS) containing either (1) IL-1ra or (2) gp41 albumin-fusion proteins. Each material was pre-conditioned prior to loading. Non-bound and loosely bound proteins were removed with equilibration buffer. Bound non-target proteins were subsequently washed from the adsorbent using a series of buffers with increasing pH steps. The albumin-fusion proteins were selectively eluted using buffer containing sodium octanoate. AlbuPure® is hydroxide stable and was cleaned with 0.5 M NaOH. The IL-1ra albumin-fusion protein (~85 kDa) was captured by the AlbuPure® adsorbent with the non-target proteins present in the column flow through (FT). 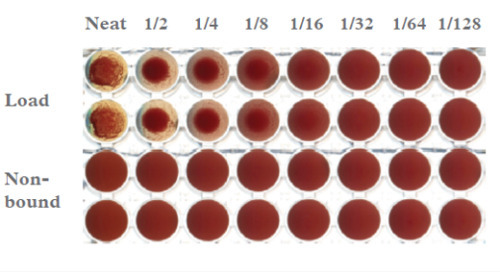 Minor host cell proteins were removed using a series of wash steps with buffers of increasing pH. The albumin-fusion protein was then selectively eluted from the column using a buffer containing sodium octanoate (Figure 1). The process fractions were analysed by SDS-PAGE (Figure 2). SDS-PAGE analysis (Figure 2) indicates high target protein binding with non-target material present in the flow through and post load wash (lanes 2 and 3). The increasing pH wash steps (lanes 4 to 6) highlights significant clearance of non-target protein (with minor loss of target). The elution fraction shows high IL-1ra albumin-fusion protein purity and recovery (lanes 7 and 8). The anti-HIV gp41 albumin-fusion protein (~72 kDa) was captured and purified using AlbuPure®. Non-target proteins were present in the column flow through (FT) and post load wash, host cell proteins were removed using a series of wash steps with buffers of increasing pH. The gp41 albumin-fusion protein was selectively eluted from the column with sodium octanoate (Figure 3); process fractions were analysed by SDS-PAGE (Figure 4). SDS-PAGE analysis (Figure 4) indicates high target protein binding with non-target material present in the flow through and post load wash (lanes 2 and 3). 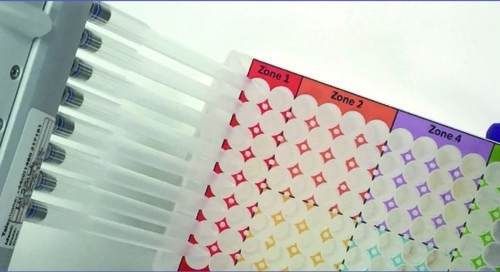 The increasing pH washes (lanes 4 to 6), indicates significant clearance of bound host cell protein, although minor levels of target is observed. High anti-HIV gp41 albumin-fusion protein purity and recovery is observed in the elution fraction (lanes 7 and 8). AlbuPure® can be used to capture and purify recombinant albumin-fusion proteins from cell culture supernatants with high purity and recovery, as shown in this application note. The AlbuPure® adsorbent can be used to purify a variety of different albumin-fusion proteins (ranging from 2.5 to 30 kDa) including; anti-HIV peptides, IL-1ra, endostation, prosaptide, Kunitz domain, scFv, dAb, nanobody and vNAR. In combination with Albumedix’ Veltis® technology, AlbuPure® is able to process complex feedstocks at flow rates up to 600 cm/hr. As a result, the AlbuPure® adsorbent can significantly reduce manufacturing costs by shortening processing times due to its increased operational flow rates coupled with the ability to clean and re-use the adsorbent over many cycles. For more information please e-mail: sales-pbl@prometic.com. Click here to subscribe to our mailing list and ensure you always receive the latest updates and exclusive offers from Prometic Bioseparations. * Data courtesy of Albumedix, reference: ‘Use of a Novel Affinity Matrix as a Platform Purification for Albumin Fusions’, Recovery of Biological Products XIV Conference presentation, Lake Tahoe, California, August 1st – 6th 2010. Mimetic Ligand™, Prometic Bioseparations Ltd and the PBL logo are trademarks of Prometic Bioseparations Ltd.
PuraBead® is registered with the U.S. Patent and Trademark Office. AlbuPure® and Veltis® are registered trademarks of Albumedix. PuraBead® - this product or portions thereof is manufactured and sold under licence from GE Healthcare under US patents 6841097 and 7341202 and any corresponding patents for life sciences research and the purification/separation of naturally occurring or recombinant plasma derived proteins. Copyright © 2017 Prometic Bioseparations Ltd.